During the summer of 1962 the Bauer family are enjoying their usual summer holiday tradition down in their bungalow on the Jersey shore. That summer though, everything would change forever as seventeen years old Isobel is found murdered. Decades later, Isobel’s younger sisters, (Julie and Lucy) their mum Maria and the Chapman family are all still haunted by the past – not to mention the boy who went to prison for Isobel’s murder. Except, it now looks like the boy convicted of the murder may have been innocent after all, just like Julie suspected for all these years. When Ethan Chapman’s daughter comes to tell Julie that Ned Chapman, Isobel’s sweetheart, has died after many years of depression and alcohol abuse, they are transported back to that summer. They find a note amongst Ned’s possessions that says he knows who really killed Isobel that summer. This new piece of evidence, more than forty years after the original murder raises many more questions that Julie hadn’t expected, how Julie has lived with the guilt over her part in her sister’s death, about her own family secrets that have played their part in this crime and about who has walked free of Isobel’s murder for all these years. As hard as it will be, Julie and her family must revisit the past that they have tried so hard to bury and find out what really happened. This is the second Diane Chamberlain book I have read, picking this one out because I really enjoyed “The Lost Daughter”. 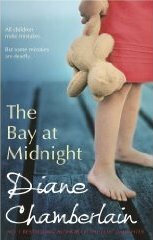 This book certainly had the same feel to it that the previous book did, like a better written version of a Jodi Picoult book is what springs to mind! As you can see from the summary, this book is part family exploration and part murder mystery which is an excellent combination if it is done correctly – which I am pleased to say, is! To make it slightly more interesting, there are three points of view in this book from Isobel’s mother, Maria and Isobel’s two sisters, Julie and Lucy. Julie is growing through her own crisis with her seventeen year old daughter. Julie was just twelve years old when Isobel died, but the events leading up to her sister’s death still haunt her now. Lucy’s take on things is slightly vaguer as she was only eight years old at the time of the murder and barely remembers anything except how terrified she was of just about everything that summer. Both women’s stories flit between that summer and the present day where they have become completely different women. The point of view of Isobel’s mother, Maria, comes a bit later in the story although the reader learns about her from the daughters points of views. However, Maria’s story is perhaps the most interesting of all the women. Her point of view spans her first memories at the bay when she was growing up, before the Second World War, during that fateful summer and now as an elderly woman. Her part of the story is touching, interesting added to the mystery of the whole book. As I experienced in her previous book, Diane Chamberlain seems to be a master in creating atmosphere and suspense in her stories. Although the reader is aware straight away that Isobel died in 1962, it isn’t until about half way through the book that we find out exactly what happened to her that night. Each flashback from each of the women reveals something more each time of the days leading up to her death but then we are taken right back to the modern day, which only made me want to read on more. Also I was extremely impressed by how well the secondary stories in the book were just as interesting to read about as the main plot. In the present story, Julie is rekindling her friendship with bay next door neighbour Ethan under the difficult circumstances of suspecting his brother of the murder of Isobel, whilst her seventeen year old daughter has fallen pregnant by a man ten years her senior. Maria, on the other hand, is happy with her life until Ned and Ethan’s father, now an elderly man himself, comes to visit her to lay the past to rest. Although not as exciting as finding out the truth of what happened in 1962, I read these sections with interest and never felt compelled to skim read until I got to the main story (which I have been known to do in other books!) Once more of the story is revealed, I would imagine that most readers would put all the pieces of the story together and realise how the events of that summer came about, I know I did, but it certainly didn’t take the enjoyment away from reading the ending, plus there were a few surprises along the way so some element of surprise was kept. I am not let down by my second Chamberlain book, it’s thought provoking, tackles various interesting subjects whilst the writing is always superb. I’m looking forward to reading more from this author. No Comments on "The Bay At Midnight"